Salman Khan is definitely raking in the moolah post Dabangg’s roller-coaster ride. But his large heartedness’ benefactor this time is his actor-producer brother Arbaaz Khan. Sallu banks with Deutsche Bank and as per sources that handles Salman Khan’s wealth, he wants to donate all his earnings from Dabangg to Arbaaz because he doesn’t like his Bhabi Jaan (Malaika ‘Munni’ Arora) doing Item Numbers in chota-chota kapdas in movies. Is Arbaaz’s financial health that bad? Does Malaika do item numbers to run the household? I thought Movie Producers are loaded guys and Dabangg is jointly produced by Arbaaz amd Malaika. Anyway Bhai Ho Toh Salman Jaisa, Dewar Ho Toh Salman Jaisa! is ths article related to the fashion at any point…. you called urself a fashion journalist and u named ur blog fashion scandal….. Totally agree with hmm…. there’s not an ounce of truth in this story !! Don’t lose your credibiliity dude. u r my favorite hero!!!!!!!! 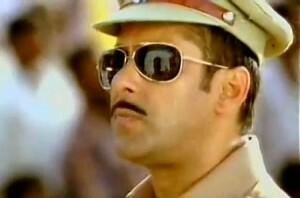 salman i love u!! !